Ezekiel is one of the best-structured books in the Old Testament. It is commonly recognized that the strongly interrelated vision accounts (Ez 1:1-3:15; 8-11; 37:1-14; 40-48) contribute greatly to this impression of unity. 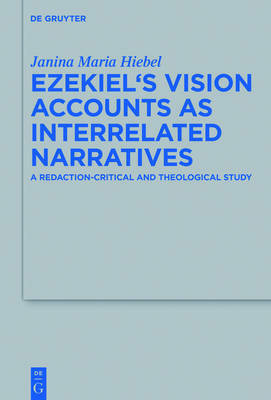 However, there is a marked lacuna in publications focusing on the vision accounts in Ezekiel as an interconnected text corpus. The present study combines redaction-critical analysis with literary methods that are typically used in a synchronic approach. Drawing on the paradigm of Fortschreibung, it is the first to present a united redaction history that takes into account the growing interconnections and dependencies between the vision accounts. Building on these results, the second part follows the development of selected themes, such as the relationships between characters, the roles of intermediate figures and anthropological and theological implications, throughout the stages of redaction. The study thus represents an important step towards an understanding of the complex redaction history of the book of Ezekiel, and indeed of its theology. The combination of diachronic and synchronic methods makes it relevant for scholars of both directions and is itself a methodological statement.